In the New Year 23andMe will be giving out a gift for kids and promoting literacy at the same time. 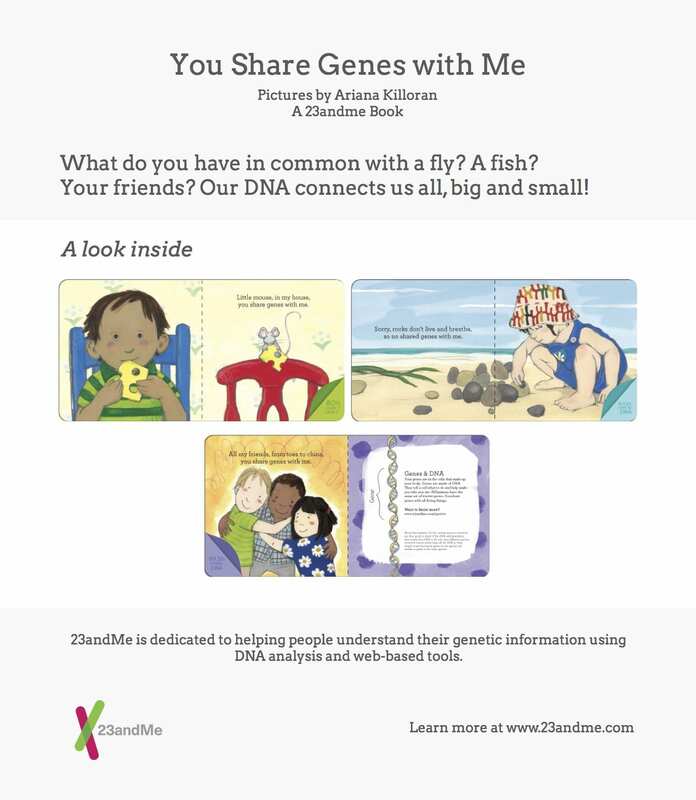 We are delivering 500 copies of our illustrated board book You Share Genes With Me to Books for Kids. Books for Kids in a non-profit organization based in New York city. Its mission is to promote literacy among children with a special emphasis on low-income and at-risk preschool-aged children. Books for Kids creates libraries, donates books, and implements literacy programs to develop the critical early foundation and skills which young children need to be successful in life. The organization focuses in particular on low-income preschool aged children who live in homes where there are fewer than five books. The foundation wants to make sure that those families have books that can engage, entertain and educate children. The organization focuses in particular on low-income preschool aged children who live in homes where there are fewer than five books. The foundation wants to make sure that those families have books that can engage, entertain and educate children. 23andMe wants that too, and the foundation’s commitment is in line with our own broader education mission. “It’s always been our mission to improve genetic literacy for everyone regardless of age,” said Esther Kim, Pharm. D., who heads up 23andMe’s education efforts. On top of the gift to Books for Kids, 23andMe is also offering up free books to the first 500 elementary school teachers who register. Each of those teachers will get two copies of the book for their classrooms. We hope that the book will help bring greater diversity of learning levels into our own academic program, which has historically focused more on high school, undergrad and medical school programs. A look inside the book, You Share Genes With Me. We’ve done that with our Genetics 101 series, our work with several educational institutions and our partnership with Udacity to produce an online genetics class. We were also involved with helping to put together a genetics exhibit with the Smithsonian earlier this year. The children’s book, a sweet picture book that shows kids how much DNA they share with other living things, came together, in part, from all that work. 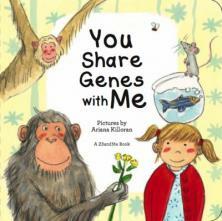 The book, illustrated by Arianna Killoran, offers a whimsical look at genetics. It’s meant to offer kids an introduction to science by emphasizing how much DNA we share not just with other species, but with each other. All humans are about 99.5 percent similar genetically, but it’s that little difference that makes us all unique. The book touches on how humans also share DNA with other species like zebrafish, mice and chimpanzees. While the book is not currently available for sale online, it can be purchased at the gift shops of the Smithsonian in Washington, D.C. and at The Exploratorium in San Francisco. You can also do your part to help out children’s literacy by donating to Books for Kids here.